At Northrop Grumman Aerospace Systems we develop cutting-edge technology that preserves freedom and advances human discovery. Our pioneering and inventive spirit has enabled us to be at the forefront of many technological advancements in our nation’s history - from the first flight across the Atlantic Ocean, to stealth bombers, to landing on the moon. We continue to innovate with developments from launching the first commercial flight to space, to discovering the early beginnings of the universe. Our employees are not only part of history, they’re making history. 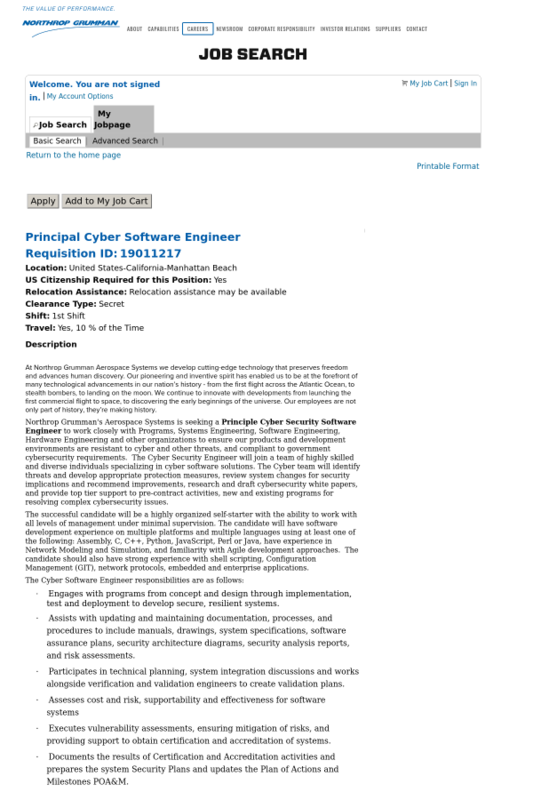 Northrop Grumman's Aerospace Systems is seeking a Principle Cyber Security Software Engineer to work closely with Programs, Systems Engineering, Software Engineering, Hardware Engineering and other organizations to ensure our products and development environments are resistant to cyber and other threats, and compliant to government cybersecurity requirements. The Cyber Security Engineer will join a team of highly skilled and diverse individuals specializing in cyber software solutions. The Cyber team will identify threats and develop appropriate protection measures, review system changes for security implications and recommend improvements, research and draft cybersecurity white papers, and provide top tier support to pre-contract activities, new and existing programs for resolving complex cybersecurity issues. · Engages with programs from concept and design through implementation, test and deployment to develop secure, resilient systems. · Assists with updating and maintaining documentation, processes, and procedures to include manuals, drawings, system specifications, software assurance plans, security architecture diagrams, security analysis reports, and risk assessments. · Participates in technical planning, system integration discussions and works alongside verification and validation engineers to create validation plans. · Executes vulnerability assessments, ensuring mitigation of risks, and providing support to obtain certification and accreditation of systems. · Documents the results of Certification and Accreditation activities and prepares the system Security Plans and updates the Plan of Actions and Milestones POA&M. · Perform design, development, analysis, and testing of networks, software and software systems, as well as oversight into the integration of various cyber capabilities into networked computing environments. Bachelor’s Degree in a STEM discipline (Computer Science/Engineering or related technical field) with 5 years of software engineering experience OR Master's Degree in a discipline with 3 years of software engineering experience.